A Lift-gate, also known as a hinge-gate allows for access through a conveyor line as opposed to walking around that line. 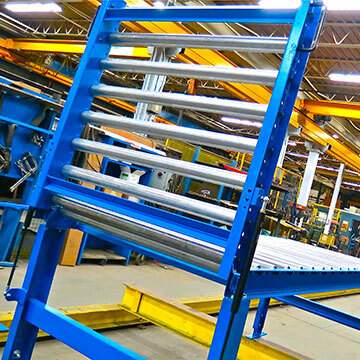 A gate section of a gravity or line-shaft conveyor line may be lifted to allow for movement of manpower or material from one side of the conveyor to the opposite side. The below chart lists “standard” Lift-gates in which we manufacture and sell with highly competitive pricing and lead times. Rolmaster can accommodate most custom “non-standard” Lift-gate requests.